Just Eating? will help young people better understand the relationship between our faith and our food. Drawing on Jesus? 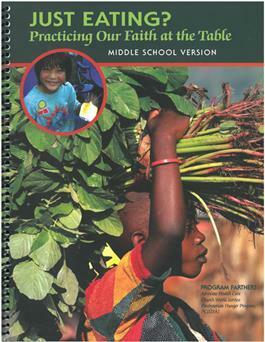 story and the rituals of the Christian faith, this curriculum will look at four interconnected aspects of our lives with food: (1) How food choices affect our health; (2) How our choices affect the earth; (3) How our choices affect others; (4) How we use food to create friend and family bonds with others. Through activities, Bible stories and illustrations in story, song and screen, middle school groups will be challenged to think about each of these areas, to see how they relate to each other, and to consider what our choices have to do with our faith. Middle schoolers will try new foods and new faith practices related to food, and consider what changes they might make individually and as a group. Published by the Presbyterian Hunger Program, Advocate Health Care and Church World Service. Download is available at Just Eating?